In 2010, I wrote a book that got me my first offer of representation. I went with a different agent, who ultimately couldn't sell the book, but she liked it so much, she actually encouraged me to self-publish it. So with much nail-chewing and hand-wringing, I'm doing it! And I can't say thank you enough to my writer-friends Susan Quinn (link) and Jolene Perry (link) for encouraging me, answering too many emails from me, and basically pulling/pushing me through my nerves. These two ladies are not just excellent writers and amazing critique partners, they're the best kind of friends. AND they have excellent resources for indie authors on their blogs! I strongly encourage you to get to know them. I'll show you covers, give blurbs, etc., as it evolves. My goal is to have it out in the next month or so, and of course, I'll give you all the play by play as the process unfolds. And as I have serious karmic payback to do, ask me questions! I'll try to answer them. Now for the Flash Reviews! In the middle of all that, I could not stop reading two books, so you know they're awesome. But I also had issues with her stories. I didn't care for The Secret Life of Prince Charming very much, so I was slow to read Stay. Mistake! This book was almost impossible to put down. From the start, it's magnetic with Clara seeing Christian in the gym. But it's told "after the fact." Something bad has happened, and she's hiding out with her dad at the beach, shell-shocked and paranoid. 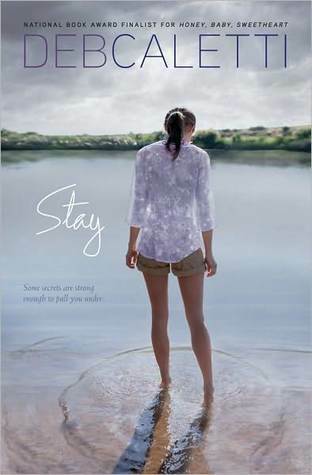 I love all the characters in Stay, and though (again) I had an issue with how a certain situation was handled, I highly recommend reading this one! This is the first book I've read by my good friend Jolene up there, and I picked it up because we were talking about Stay, and she mentioned she'd written a book about an abusive relationship. I wasn't sure I wanted to read it just yet because, well, bad boyfriend overload! But I got it, thinking I'd just dip into the beginning and if it got too intense, I'd put it aside and recover with a Sweet Valley High book or something. I started reading and could not put it down. Ronnie's first boyfriend is her neighbor Shawn. He's her first "peanut butter kiss" (love that), he's runaway trips to the beach... but his family moves away. The two keep in touch through letters and occasional family trips, until he moves back. But a different guy seems to have returned from the one who left. Shawn's family is troubled, and he's picked up some bad (and painful) habits. 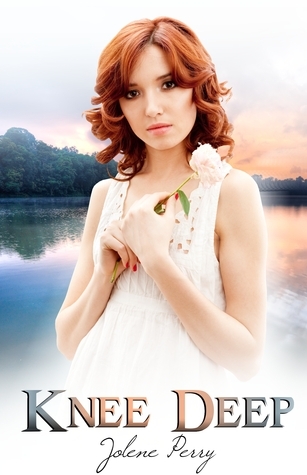 Ronnie can't seem to let go of the boy she remembers, but she has to before it's too late. Knee Deep had me smiling, crying, angry, but I had to find out what happened. Awesome characters, fantastic chemistry, great writing--you will love this book. Finally, what's this about a happy place turned ugly? Well, it falls under the heading, "Say It Isn't So." In my self-publishing research, I've uncovered an issue that has shocked, angered, and kind of scared me. In the past year, I've heard some of my indie-writer-friends talk about reviewers on Goodreads. And I've seen warnings along the lines of "never engage with reviewers." At first I was like, "Yeah, that's true. If you get a negative review, you just have to take your lumps with grace. It stings, but not everybody's going to like your book." Lately, I've heard something more sinister is happening. I've been told there's this cabal on GR targeting authors and basically killing books (and careers) with low ratings and nasty, sometimes ad hominem reviews. And I've been told it can be over things like giving a low rating to one of their friends' books. Is this true, writer-friends? Have any of you bumped into this? Being a book lover, book reviewer, former journalist, and founder of a book club, I can't believe this is happening--or being allowed to happen. One of my favorite things is talking books, freely and openly. And I still want to believe that if a book's really good, no amount of meanness can kill it. But I'm new. And I have no reason not to believe the source of this information. It makes me wonder if I even want to be on GR, and that's just sad. GR can be such a useful tool. And it's really impossible for an author to avoid--anyone can make a GR page for your book. If this really is happening, can anything be done? Are any of my writer-friends taking steps to guard against it? What? and Why or Why not? Congrats, Leigh! :) It really is exciting. Which book is it? Would you like me to do a review? Sorry, getting click happy here. Yes, I've seen this happen on Goodreads. Someone even put a two star review of my book before it was even released. But there is also PLENTY of good on goodreads. You just can't NOT be on it! Sounds like you've got lots of excitement ahead of you--I'm glad you have such experienced authors to guide you through it. As for the GR thing ... I don't rate or review books there. It sort of seems like a potential mess for an author to do that. I know lots of people feel differently, but that's the decision I've made. In terms of groups of reviewers: GR is a social media site, like FB. No reason to believe similar dynamics wouldn't occur there. But I agree with Jessica, in that there are countless numbers of users who are only there for the love of books. This is a big announcement and good luck to you! If this is really happening on GR I'm afraid it might kill a really nice resource. I'd be done that's for sure. Congrats Leigh! So very excited for you. And yes, I've heard about the GR issue. So sad but I haven't encountered it so hopefully you wont. There's a lot of good there too. So excited for you, Leigh!! You know I'm here for whatever you need. Can't wait to watch your journey unfold! Yay! It's fun to move forward especially after all the hard work that goes into a novel! Can't wait to see it out there. Congrats on this big (huge) step! My take on GR: I only ever give a book 4 or 5 stars - no specifics. If I can't give that, then I don't rate the book at all. Congratulations, Leigh! Great news for you!! And thanks for the book recommendations--I'll keep them in mind. I haven't had any bad experiences with GR, though I've heard the stories. Good luck with the self- publishing of your book. You've got good support there. I don't do Goodreads or other public review sites at the moment. I dislike the swarming effect that occurs. I don't know about Goodreads, but I read a newspaper article on how out-and-out extortion is occurring on other consumer sites. One restaurant owner had someone demand a free meal, or that person would put a nasty review online. And you can imagine how someone could trash not just the food, but bring up fake sanitary issues. The review sites must come up with a way to police themselves to maintain their credibility, or they will be rife with petty revenge and extortion. But other than that, have a nice week! I never knew that about goodreads, glad I never used it and I'm not going to now. Amazon works for me, congrats on self publishing too, although it is a ton of work. Congrats on your self-publishing decision, and I can't wait to read your novel! Also... YIKES! Your GoodReads warning just made me sick to my stomach. Please keep me posted on this if you find out more! A huge congrats for making that scary decision to self-publish. I'm looking forward to watching it all evolve. CONGRATS and best wishes on your decision to self-publish your book! I look forward to hearing more about it in upcoming posts. And wow, I hadn't heard that about Goodreads . . . then again, I barely, grudgingly, opened an account and haven't explored at all. Kindof crazy how vindictive people can be though. Congratulations on your decision. I look forward to hearing all about your experiences. Wow. That Goodreads stuff is kind of sad. I tend to weigh star ratings by close friends more heavily than the aggregate ratings, but it does make me think about my rating system. Right now I only post ratings for 3, 4, and 5 star books. Thanks SO SO SO much for the shoutout!! So. yes. Happens. I have NO idea who these people are. Have NEVER had dealings. Have NEVER responded to a negative review. EVER. Congrats, Leigh. I'm so excited for you. Can't wait to read your book. YAY!!! As for the GR issues... I've got no comment... other than to say one girl gave me a 1 star review, and though I didn't read it, I laughed out loud at the pics she posted within the review. I say props to her. She put a lot of effort into it. Yay for you! I'm so excited to see your book out in the world! And I'm on GR and, for the most part, have not had issues. But I know many (many) people who have. It's sad. But the interwebs is a crazy place sometimes. There's no avoiding that. Good for you, Leigh! Diversify! Can't wait to hear more about your book. Contemporary YA is my fave. As for Goodreads, I just joined recently and am having that weird experience of total strangers adding my book as "reading" when the only thing available is a 2.5 chapter sample. Spoooky. I'll let ya know how it goes. Hopefully there won't be a nasty pile on because I rated Twilight low. I just didn't want my box full of paranormal title suggestions. That genre doesn't appeal to me--simply a taste preference. Go for it and great good luck to you! First of all, CONGRATULATIONS on publishing your debut! That's so exciting!! I'm so naive when it comes to reviews. I kind of share the same view -- the cream rises to the top. And I've heard (this is probably where I'm super naive) that even a terrible review generates publicity, so there's really no such thing. I've also heard it's a good idea NEVER to read reviews, good or bad. *sigh* If you can ignore reviews, I would, and just trust people to see through the petty, angry people out there who are full of crap. But, like I said, I may just be naive. I'm not sure what you can DO about it if you do have someone nasty targeting you. Sometimes I think overly good reviews can kill a book (stay with me here). So many times I see books where people are gushing and gushing over a book and I can't help but think, "These must be friends of the author." ha ha! I like to see well-balanced reviews and I dislike it when books get so much hype that when you actually read the book, you're disappointed. Best of luck navigating these unknown waters! Good luck on your new publishing journey, Leigh! Good luck with your book release, Leigh. I can't believe people would ruin other people's reviews, but I guess I can. I just heard about the established authors who did it on the radio yesterday morning. When I meet authors, it's so much about pulling one another up. I like to think of our community as a positive, nurturing one. Awesome, Leigh! I'll be happy to help any way I can. I've been on GR for several years. There are curmudgeons, but they're on every site. I've not had such a backlash, but I'm not socially active on GR's. I'm there and I advertise on GRs. I only review friends' books and traditionally published. I don't pay attention to reviews on GR or Amazon. I don't trust them for numerous reasons. I listen to the recommendation of friends first. Aug 6???? My kids just started back yesterday. Congratulations! And no - meanness can't kill it if it's good. You will encounter those, but they are in the minority. Congrats on your book, Leigh! How wonderful! I only leave GR stars for books I have beta read. That's it. I use GR more to keep track of what I'm reading. It's sad that it gets so poisonous on GR. Sad, because there are a lot of good people and good reviewers on there. Whoop whoop WHOOP! Many congrats, Leigh -I love the cover. And the title! And I can't wait to read it! Hey, that's great, Leigh!! Best of luck with it! Personally, a few bad reviews won't kill a book if the book is good, but it is sad that stuff like that happens. ooo... I hadn't heard if it. I haven't really done much with GR. Just lack of time really, but I hate to hear of peeps bashing other's work. So immature. Congrats on self-pubbing! I think it's great and I'm leaning more toward it all the time. I'm excited for this new adventure of yours. I'm sure it's terrifying, but I think it's a good step. I have no clue about the truth of Goodreads sabotage, but I will say this. I only do 'negative' reviews for the few classics I hate or millionnaires who are not going to be harmed by the likes of me (Stephenie Meyer sorts). I tend to stick with 4 and 5 star reviews for the standard small-time 'authors like us' or else skip it. (not to suggest lack of review means a negative-skipping... I also tend to get distracted). In terms of RESPONSE though--not going there. I've not engaged on Goodreads except to 'like' when people have taken time to review... erm... though I haven't given likes on my 2 and 3 star versions... mostly they feel to me just like readers who are never going to like my style anyway... just let em roll. The only review I've ever commented on was an amazon one where the reviewer posted a review for the wrong book--I knew they'd read the RIGHT one, as they'd done a Goodreads review, so I just thanked them for reading but pointed out they'd pasted the wrong one in that spot. They fixed it and that was that. Major congratulations!!! I'm so excited for you. I'd had a similar experience. I went through two agents and two small presses before I decided to self-pub, and I love it! Good luck! I'm so happy for you that your books are getting out there. You of all people deserve it. We can't do much about the meanies, I'm afraid, except pray for them. Maybe that sounds cheesy, but it's how I cope with bullies and other nasties. Another therapist told me that she deals with negativity from clients by imagining that she's leading them into a chapel and gently closing the door on them. Otherwise, she ends up dragging them and their problems around with her for days on end and gets stressed out about them in addition to the stuff in her own life. I hope you get some peace soon about this problem. Much success with your book - and I'm not faking. Good for you, self publishing this book! For me, this is why I love SP...all those books that were cast aside not because of merit but because someone decided what would sell and what wouldn't...these books are going to find their way to readers. How awesome.